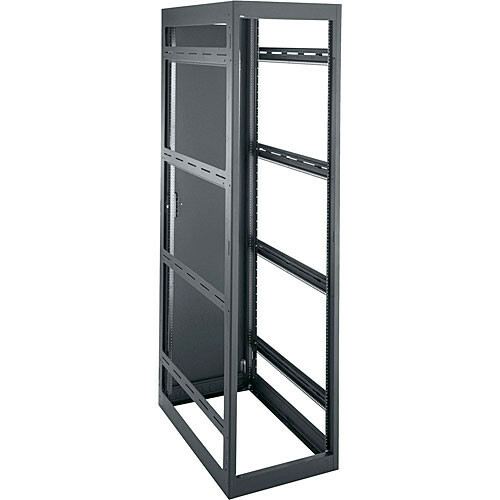 House your equipment with the Middle Atlantic MRK4436 PRO 19 x 33 x 77" 44SP Rack with Rear Doors. This rack securely and attractively holds your expensive equipment with fully welded construction, 14-gauge solid steel tops and bottoms, and 16-gauge solid steel sides. And the narrow design is good for large scale, multi-bay jobs. The configurable top accepts a number of top options while the bottom features an installed grounding and bonding stud. And the interior gives you more room with two pairs of wider rackrails. This professional model features the cage nut style rackrails. This professional version of the standard MRK4436 has all of the qualities of the standard MRK4436 but also features the cage nut style rackrail.